What is our job as games educators today? A common answer to this question is to generate hireability. It seems like the value of game education hinges on our ability to integrate prospective game developers into an existing labour market. This labour market appears in our institutional meta narratives and is often connected to an unchallenged set of “best practices”: Scrumming, pitching, jamming, failing early, specialising, polishing portfolios. In short, we prepare students for a life in which they live for videogames in order to make a living. In which they become hireable. But lately, we start hearing different stories. Games, as profitable as they are, are becoming an increasingly unstable industry. And one that burns out highly talented creatives at a mindboggling rate. Devs in so-called employment relationships live in the constant fear of being laid off after the next project; if hey don’t collapse from burn out before that. It starts early. 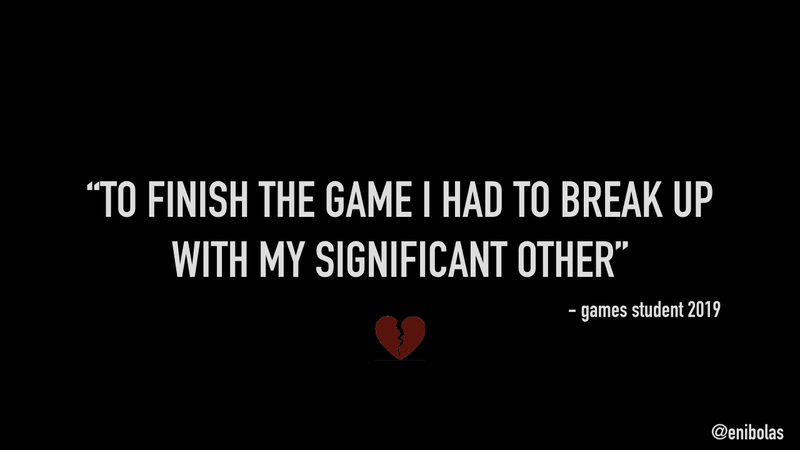 As a highly productive student in one of my recent classes proudly wrote into their course resume “To finish my game, I had to break up with my significant other”. The student felt they had to ditch a loved one over a BA student videogame. This was happening in a design school, mind you, whose leading faculty pushed hard for the artistic and political valency of videogames in their curriculum; an idealism crushed under the tangible dictate of hireability. Couched in the provisional safety of my own precarious academic niche, I watch the most talented students buy into and burn out inside this paradigm. It’s a well-documented ritual, starting with generous investments into the promise of a well-paying job. I see students take out horrendous loans and work multiple jobs to pursue the dream of becoming a video game rockstar. Due to their passion and hard work, they land an internship or a junior position, most of the time not in their core field of interest (“Oh you are a woman, you should be our community manager”). A new report by the Higher Education Video Games Alliance (HEVGA) suggests that while game dev alumni have no problem finding a job after university, their job satisfaction steadily decreases over the years. This tends to be gendered as well – women and LGBT+ folks are more likely to drop out more quickly. The reason? Rampant misogyny and other forms of discrimination, such as toxic assumptions about unpaid labour, extra advocacy work combined with a loss of purpose. From the perspective of institutional performance ratings, we’re sorta fine with that. The students were hireable after all. The problem is that the idea of hireability is based on a 1950’s cliché of a secure labour market. I remember when my nan, who held a life-time employment under the conditions of a soaring 1950s Austrian economy used to ask me: “Have you found “a” position yet”? Or, in an attempt to encourage me: “You will certainly find a position you like”. What she meant, of course, in either of these cases, was life-time employment relationship inside a secure and thriving company designed to sustain my mental and physical well-being. Stable salary, paid vacation and a nice Christmas bonus. We need to face the facts and start asking other questions, harder questions: Questions that don’t originate in quantification. Such as: How will students have a stable life in an industry which doesn’t seem to offer one? 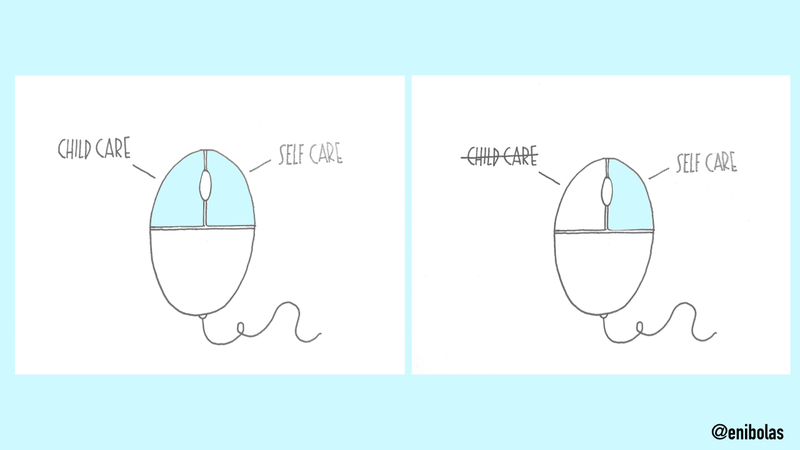 How do we ensure our students will thrive while doing game design for a living? While game education certainly cannot solve the problems of neoliberalism and the current gig economy, it can take this question to heart and formulate strategies which are more versatile and sustainable in addressing our students’ futures. I think of this challenge in terms of a question I ask my students in my mind: Did my course equip you to define your space in games culture? Did you learn skills which actually allowed you to express what you want to express? Do these skills bring opportunities which enable you to build a sustainable life? But this is the future. Back to the now. In the now, we face the serious challenge how we might we go about teaching such skills. The answer I present in this talk is experimental, and rudimentary. For now, let’s call it teaching games that care – or rather the making thereof. Here is a disclaimer: My idea of Games that Care is not intended to claim that it can save a structurally broken economy. It intends to teach students to find new contexts and consumer groups, and be less dependent on existing markets and industry logics. It is supposed to inspire deep connections to the real world, by encouraging students to work on what they genuinely care about. I started being interested in this approach while writing on my thesis on games and bereavement, which is now available as a book. In Games and Bereavement, I was interested in developing meaningful ways to represent attachment, loss, and grief experiences in videogames. This interest was borne from the conflict that – in 2011 – these subjects seemed fundamental to human experience and absent in games. The stakes were personal. 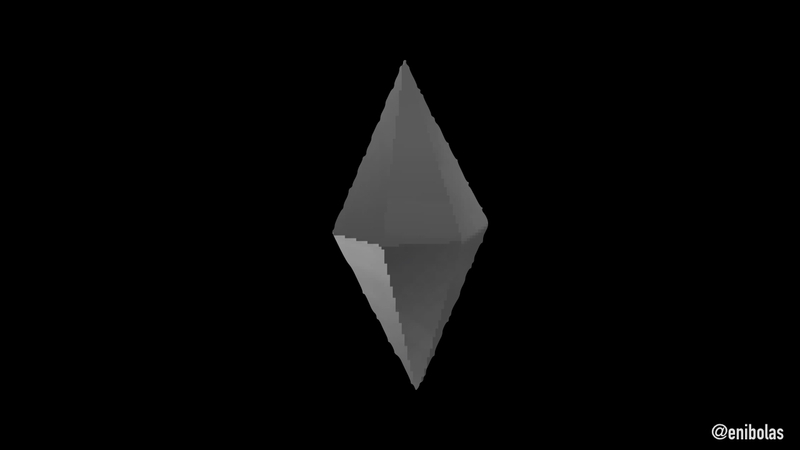 When my baby Nico died in 2004, I found one way of coping with this by rebuilding my experience in The Sims 2. I was able to design two young adults to the liking of my partner and me. A baby was born through the sanitary animation which did nothing to simulate the hard work that is birth. And at the point at which Nico was supposed to die, the Sims 2 resisted: It did not let me represent my experience. This game about life literally did not support mine. By disabling the death of babies, the game symbolically erased the experience of thousands of other ex-parents like me, expressing the unspeakableness of our fate through its mechanics. Finding mechanics which care, then, seemed crucial to me. And it seemed like a good idea to do so by collaborating with students and other bereaved mothers. Parts of this project were presented at GDC 2017. Today it’s the first time that I talk about the didactic side. Before I continue, I want to note that teaching grief-based game design may appear like it’s on the extreme end of what a game design subject can be. This is because it’s such a stigmatised topic. To many of us, grief is as ordinary and essential as drinking water. And that’s why I chose to work with it. I want to encourage you, however, to think how the teaching methods I present in this talk may relate to what you find ordinary and essential. And how you might introduce that to your curricula. I also want to note that the methods I used don’t come out of the blue, but they have histories, in the plural. One of these histories is the long-standing tradition of participatory design, and its more recent mapping to game development. Participatory design emerged as a politically motivated methodology – driven by unions and workers – to include end users in the design process of their future working environments. In a game development context, the importance of the user has been emphasised as well, especially in player-centric design. One example is Tracy Fullerton’s classic Game Design Workshop which now celebrates its 4th edition. In the development process, it is essential to many studios to conduct play testing in later stages of game development to give feedback on a fully formed concept. However, participatory game design goes a step further. It insists on the inclusion of users and experience experts early on in the process. This can have two advantages: First, It grounds technology in the world of real players and their needs. Secondly, it lets these needs inspire new technologies, and new contexts of use. Participatory game design has been used in various settings around the world, but there’s two examples that have had a particular impact on my work. These are the Deep Games Lab at Chicago’s DePaul University, and the Denmark-based Game Girl Workshop. The Deep Games Lab teaches design processes which are built on experiential resonance between maker and design. Students are taught how to work with the symbolic language of people who have gone through difficult yet common experiences, like eating disorders, depression, or domestic violence. The explicit goal is to use game design as a way to foster a deeper understanding of these experiences rather than designing for a measurable “purpose”. The Game Girl Workshop is one of the earliest Europe-based feminist game-focused initiatives, using a semi-professional all-female setup to guide girls and teenagers through a development workshop from scratch to finish. A core pedagogic principle is to increase the girls’ self-efficacy in a world basically designed against them. It is to encourage their voices, opinions, priorities through game making. It does not expect these priorities to align or compete with common game development paradigms. Game development should make space for what is. By learning from these efforts, my work is part of a wider community spirit which desperately needs game development to change from rationalised, optimized information processing to practices of care. This long, but necessary introduction takes me to the agenda for the rest of this talk. 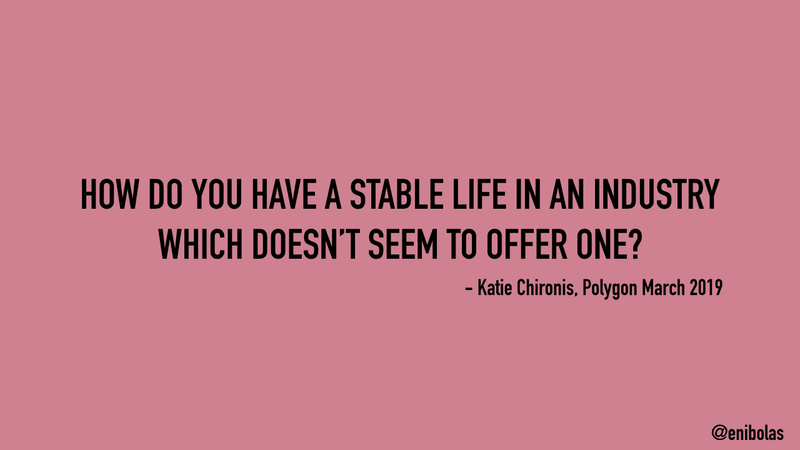 My ambition is to give you a vertical slice of some of the didactic decisions that went into teaching Jocoi – a game about grief. I will not go into much depth with the design elements of Jocoi, the game that was produced during this course. 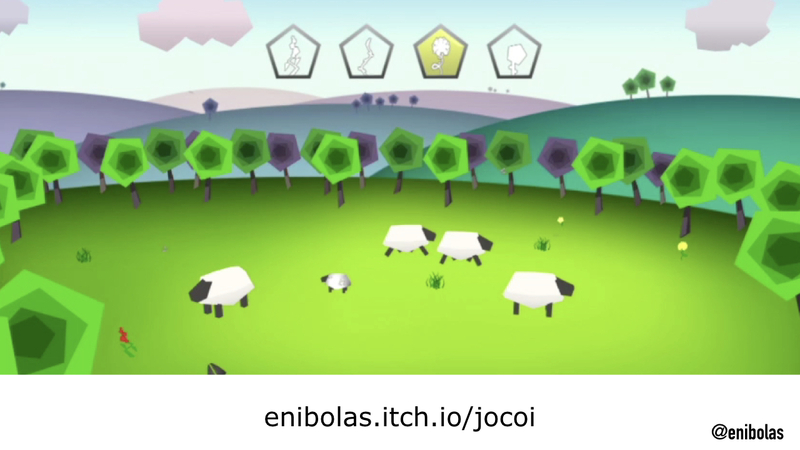 Those of you who are interested in it can check out my previous GDC talk or find the game on itch.io. Instead, I will talk about my teaching methodology as a case of how care as a dev skill might be introduced into our teaching curricula. I will start by talking about the context of how the participatory game design was set up and who participated. Then I’ll talk about how I prepared the class, and how the dialogue between students and participants impacted ideation. I then move towards usability testing and the question how to evaluate a game made with and for grievers. Each of these steps involved interesting risks and challenges, I will reflect on along the way, and in a brief final question: why care? About the context of this class: Our participants were four white women in their 30s who responded to a call channeled through the Austrian self-help group Regenbogen (German: Rainbow). My student team was composed of white, predominantly male BA game engineering students in their early 20s who took the course as an elective at the Aalborg University Copenhagen. The course stretched over a period of three months, during which the students developed the game Jocoi I mentioned before. When it came to the women, their motivations to join this project were political and personal. On a political level, they shared the hope to create awareness of pregnancy loss as an ordinary experience worthy of destigmatisation. They had no particular interest in videogames, but they were enthusiastic about the outlook of being included. On a personal level, the women shared a hope to remember and celebrate their experience of motherhood, even beyond death. They expressed this in the way they gave their foetuses names and spoke of them as children. For them, keeping in touch with the inner images of their their late children was important, even years after the loss. The students took the course mainly to complete their BA course credits and to create an innovative game with a deep message.In short, motivations differed. My teaching challenge would be to find a way of facilitating a conversation between these groups. An additional challenge was that the two groups were located in different countries and spoke different languages, which required cross-cultural mediation techniques. I found one such technique in an approach called Muse-based game design by Rilla Khaled. Rilla suggests that dividing the roles in a design team between those who inspire – the muses, and those who create can be helpful to structure a participatory design process. 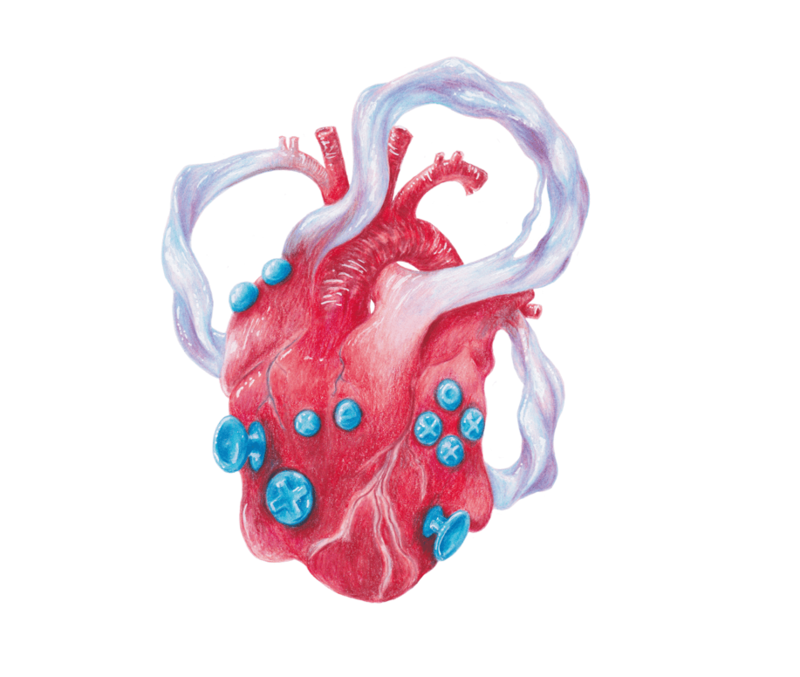 In Rilla’s words: “[M]use- based game design [is] an experimental empathic design approach foregrounding a dialogic artist – muse relationship between a game designer and player. Following a user research stage focused on learning about the player, the designer forms idiosyncratic design constraints inspired by and relating to the player, which are then used to inspire ideation” (Khaled 2012). In Rilla’s original pedagogic setting, students are the ones conducting this research stage. But in our intercultural setting it was more useful to gather Muses data beforehand and provide it in a semi-processed shape at the beginning of the class. The data handed to the students included images and transcribed conversations of a muse workshop carried out prior to the course. Needless to say, this required some preparation. Prior to the course, I ran a “muse workshop” in which the women explored a single question: What did their relationships to their babies feel like? They explored this question through an imagination exercise: What if they could visit their baby on a planet? In response to this question, the Muses created metaphorical images and eventually mock-ups of their relationships, informative of their current grief situation. In other words, they started a process of symbolic modelling, constructing haptic worlds which my students engaged with over the course of the semester. When I went about constructing the teaching materials, I noticed in great horror the risk I had set myself up for with this method: I could translate and transcribe what had been said and done in the workshop. But would I be able to honour all the small gestures creating affective bonds between the muses and myself? All the small talk, laughs, nods, coffee breaks, and collective sweating in a hot room during early July: these were things which contributed to the way the mock-ups were designed. Would these be lost in translation? Ironically, the act of writing about experience erased some of it. On the other hand, this created some speculative room for students’ engagement with the models. What mechanics, aesthetics, and dynamics did the mock-ups invoke? What speculations did they inspire? And how did the students connect to these worlds? These were important questions during ideation. One symbol that drew the students’ attention early on was a mockup we called the cave. The cave was built by a woman who defined her setting in an excruciating amount of detail. The cave was composed of two layers, an inner cave and an outer cave, surrounded by an island. Inside the cave lived the baby, which had to be nourished by an army of playable characters – all of them family members and friends. The goal of the cave was to make the family leave in a spaceship. But first they needed to collaborate to make the baby grow enough to be left behind safely. 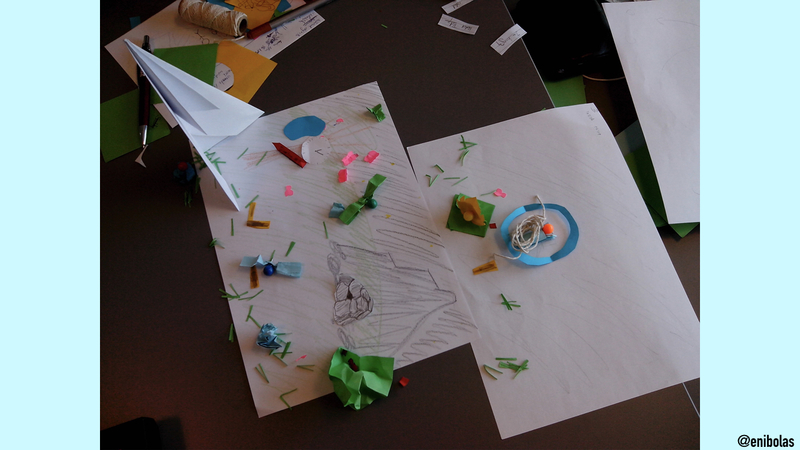 The students created a paper prototype and added features; multiple playable characters, multi-layered level design, customisable audio and lighting, lock-and-key puzzles, shape-shifting, feeding and holding mechanics, an atmosphere which conveyed being in an eternal space, oh, and what if you could build the spaceship? The feature list grew and grew, as did the doubts as to whether this could be possibly achieved within the constraints of a 3-month project. At the same time, leaving out the slightest detail from the mockup – wouldn’t that necessarily mean misrepresenting the women? This was a good moment to step back and remember the laws and limitations of representation. 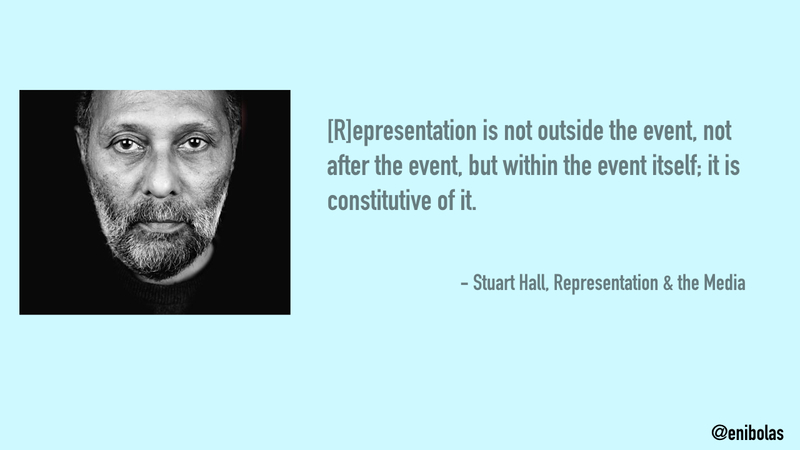 According to British media scholar Stuart Hall, representation does not reflect reality. It constructs it It is not outside the event, not after the event, but within the event itself; it is constitutive of it. This means it is virtually impossible to represent truth. Not even through engineering. For my students, this meant learning to embrace their own interpretations of the planet mock-ups. What did they see, feel, and understand about them? what constructed their genuine truth about it? This insistence on embracing what personally speaks to you – is something I learned from Rusch’s work on symbolic game design in her insightful book Making Deep Games. Doris recommends to rely on the developers’ personal symbols and associations when creating games about emotional subjects. I would add that this is especially important in participatory settings: Rather than overwriting the statement of your partner by trying to represent them truly, use your own, different words to create a genuine response. 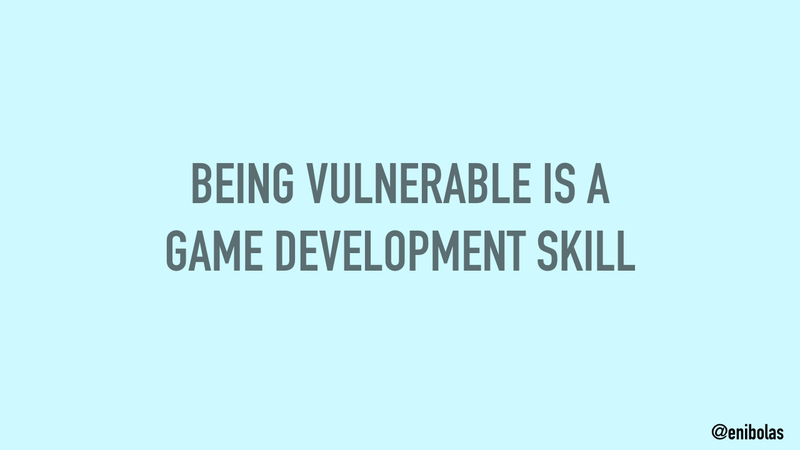 Being vulnerable is a game development skill. When taking their own perspectives seriously, the students started identifying symbols in the mockups that interested them more than others. They also started seeing blind spots in the women’s conversations which were essential for understanding their grief. For instance the women had taken a perspective of survivorship rather than grief. Death was more of an unspoken reality framing the wish to stay connected with their babies. To honour this reality, the students decided to model loss in Jocoi’s control scheme. In the game, the player first builds up a connection between a mother sheep and her lamb, through a shared control (the left mouse button). After the lamb is lost in an earthquake, the button, which used to facilitate child care is no longer available. 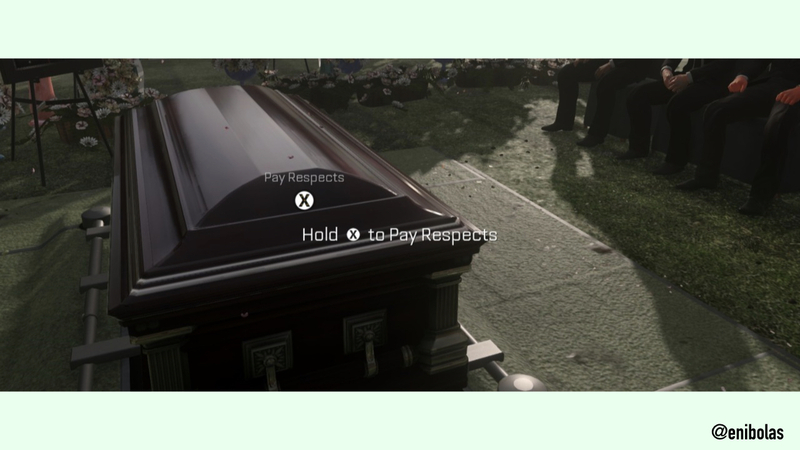 This is supposed to make players feel a sense of loss on the physical haptic level of gameplay rituals. One of the most daunting questions was how to teach suitable methods for evaluating Jocoi. I decided to let the students figure it out by themselves. This led to some exciting frustrations. For the first iteration of the game, the students decided to conduct usability tests with fellow university colleagues, using quantitative questionnaires. Their main concern was functionality – which they divided into two parts: Did players know what to do? And did players know what to feel? While the first part returned clear results, the second part – did the players feel the right thing – produced messy data. The playtesters seemed incapable of identifying their emotions by choosing the correct options in the questionnaire. This uncertainty confused and frustrated the students. It took some work to unpack the root of their frustrations. As it turned out, the questionnaire had been built on a common myth in affective engineering: The idea that developers can engineer user emotions by making “correct” design choices. In this paradigm, an information unit is triggered in a user when they interact with technology. This myth is summarised in the brilliant research of Kirsten Boehner and colleagues who write: “In affective computing, affect is often taken to be another kind of information—discrete units or states internal to an individual that can be transmitted in a loss-free manner from people to computational systems and back” (Boehner et al 2007). This myth suits engineers because it translates complex emotion into quantifiable information units. But scientifically speaking, there is not much evidence that that’s really how emotion works.Instead, What the researchers suggest is that emotion is more like a web of messy interactions rather than information units. For my students, what kind of UX methods were out there to measure emotion as interaction? Spoilers: very few. 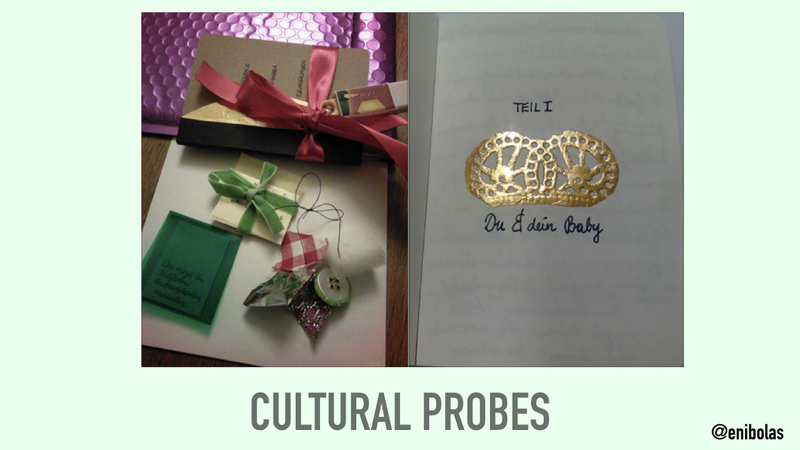 We ended up with a method called Cultural Probes. This method was first used in the context of urban design by Bill Gaver and colleagues. Cultural probes are small activity packs given users with the hope for inspirational feedback. The package is handed over in a little ritual and after that the user engages with the contents, and returns them at their own pace. In most cases, probes are used as a way to establish a connection with unknown research participants. In our case, it served as a tool for reconnecting, and testing the second iteration with the muses. 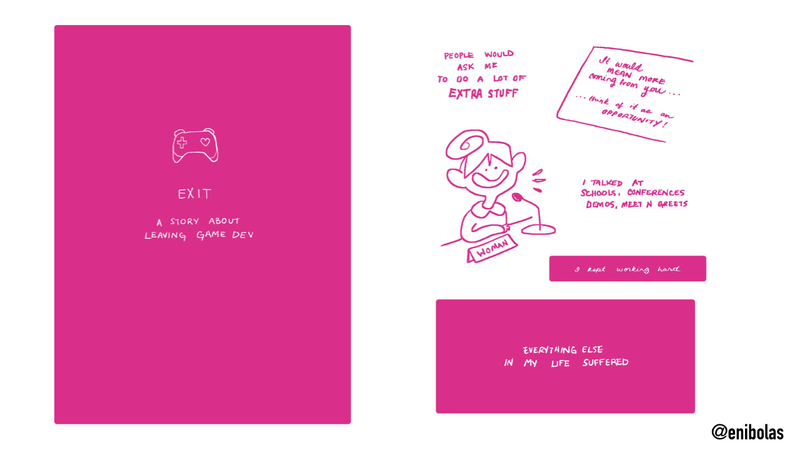 The package contained post cards, the game prototype, and a personalised scrapbook. 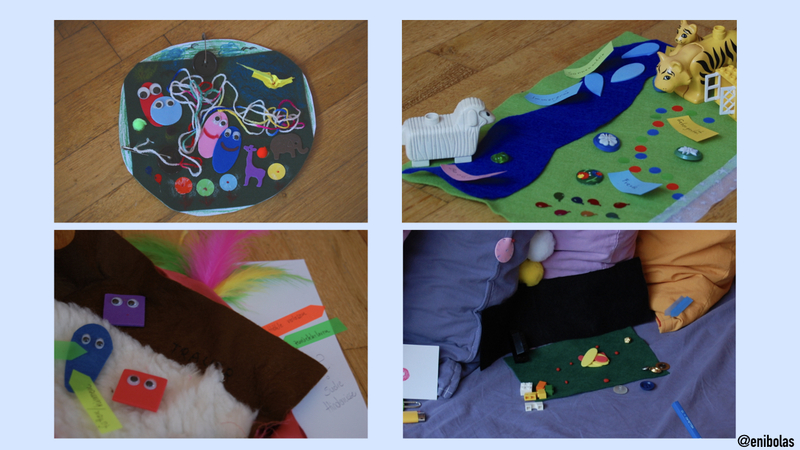 These materials were supposed to invite the muses to think about the workshop, the game prototype, and their mother-child relationship. On the day the probes were launched, the disadvantages of this loose method became relatively clear. Two of the four muses had to cancel the ritual, and then had technical issues with the game. Since other probe contents depended playing the game, they had to be returned blank. However, the probes which were returned were of great value for the polishing stage of Jocoi. By now, the students had learned that the muses were supposed to inspire rather than dictate their process. The probes offered additional support in crafting an appropriate atmosphere and feel of Jocoi’s world. Overall, what the students had learned from exploring quantitative versus speculative UX methods was the value of associative, ephemeral feedback which was less quantifiable but more rich. 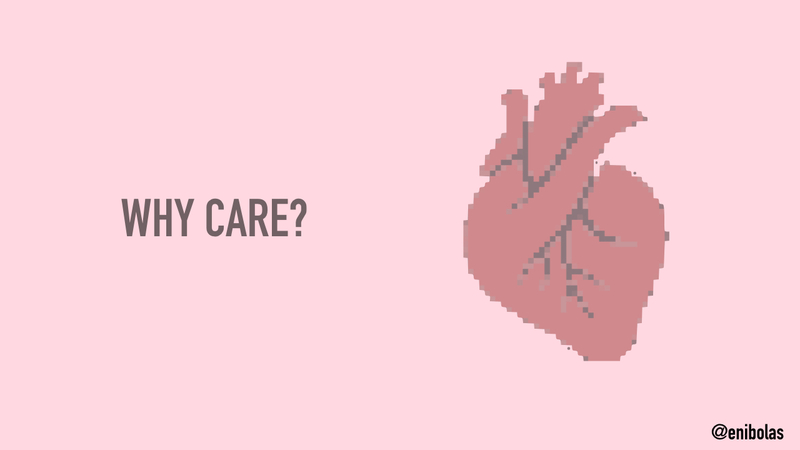 So why care? The processes, tools, and learnings I have discussed in this talk are in many ways a lesson of care through engineering. Guiding my students through a development dialogue with grievers was a way of confronting some basic myths in video game engineering, and updating them to respect the real world, and each other. It is important that one source of respect is respect for one’s own vision. Games that care do not simply care about players, or in-game representations. They care about those who make them, too. They commit to decisions which resonate with and validate creators. Games that care cannot promise my students to find a stable life inside a troubled economy. It cannot prevent them from breaking up over a videogame course. But it can inspire the choice to develop games they care about. And this may lay the foundations for a more full, potentially interesting worklife. Months after the end of the project, one of the participants asked me to present the game at a self-help group networking event in Vienna. Strolling through the room, I noticed a heavy photo album displayed near the entrance of the group’s office. When casually flipping through the pages, I stumbled over a section called “our mourning game”)which contained two photographs from the project. The images were carefully arranged and glued on thick dark blue paper. One of them showed a still from the game, the other one displayed two of the Muses looking over my shoulder. I cannot remember having this photo taken. I would like to thank Ida Toft & Simon Nielsen for helping me develop this talk.